Frank Gold (left) with Fraser Ashley. 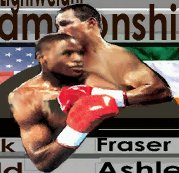 Frank Gold is an American lightweight boxer who in 1992 was scheduled to face Fraser Ashley. This page was last modified on 22 April 2014, at 19:21.